I love pancakes….and I love blocking. Combining the two together into a Pancake Block makes me giddy, and in case you were wondering, a pancake block is one in which the blocker flattens a defender and buries him in the turf. August 1st marks the day Quinn "The Pancake” Johnson begins his assault on would-be tacklers across the NFL. Does Johnson get the moniker, Pancaker, because, much like pancakes, he is awesome? 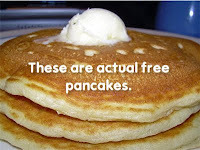 Seriously, pancakes are awesome, what other food has an international house? No, he will from here forward be known as Pancaker because in his final season at LSU, Johnson was credited for 70 pancake blocks and looks to continue with the Packers where he left off in college. Think about that. It means he averaged just over 5 blocks a game last year where he took a defender to the ground. After reading this draft pick analysis, I contemplated dubbing Johnson: Whale Spout or Blow Hole, but for some reason the evolutionary miracle of a whale’s breathing just can’t live up to the fluffy, syrup-covered goodness of a pancake. I thought about Lava-Spewing Volcano Man-Freak, but a pancake still beats a volcano 9 out of 10 times in a fair fight. And so, enter Quinn "The Pancake" Johnson. The song, The Mighty Quinn, ends with the line: “You’ll not see nothing like the Mighty Quinn.” Yessir, Mr. Dylan. I’m looking forward to it. Hopefully Grant doesn't get distracted by seeing The Pancaker pushing 4 guys out of his way. "No, man, you can't stop and watch! Keep running!" You are obsessed with food, aren't you? Coach McCarthy wants me to add 10-15 lbs for the season.